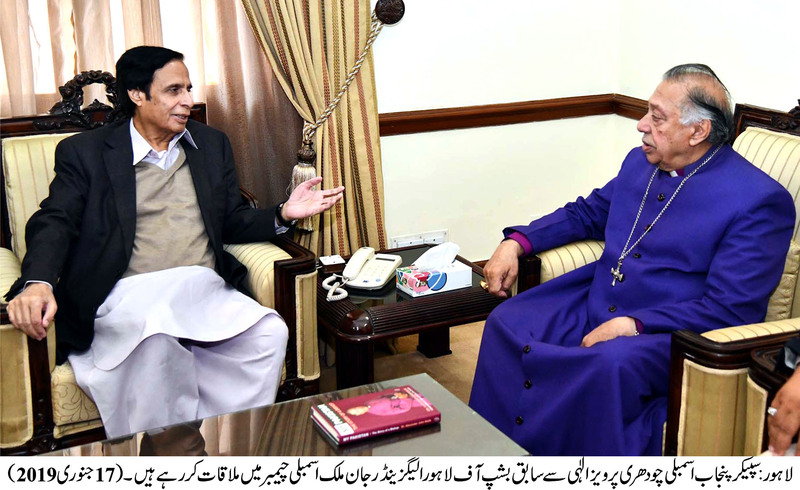 Lahore: 17-01-2019: A delegation of Kissan Board Pakistan headed by its President Ch Nisar Ahmad and former Bishop of Lahore Alexander John separately called on Speaker Punjab Assembly Ch Parvez Elahi here today (Thursday). Farmers’ delegation exchanged views with the Speaker regarding problems faced by the farmers, they pointed out miserable conditions of the potatoes farmers. Ch Nisar Ahmad said that the neither the sugar mills are not buying sugarcane at the government rate nor they are making payments timely, even the outstanding payments of last year have also not been paid by some mills so far. The delegation also demanded that Punjab Agriculture Commission and Agriculture Advisory Committees at the district level be activated. Speaker Ch Parvez Elahi said that the farmers are our strength. He assured the delegation that he will try his utmost go get the farmersa problems solved. Ch Nisar Ahmad said that your interest in the problems of the farmers is proof of your farmers’ friendship. Kissan Board Secretary General Ch Shaukat Ali and other members of the delegation thanked Ch Parvez Elahi and expressed the hope that he will play his role for getting the problems of the farming community solved like always. 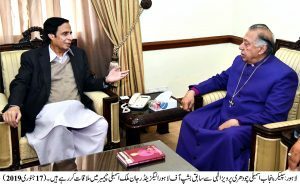 Former Bishop of Lahore Alexander John Malik presented his book Pakistan “A Story of A Bishop” to Speaker Ch Parvez Elahi. Talking to him, Ch Parvez Elahi said that every Pakistani irrespective of religions and sect will have to play for security, progress, prosperity and peace of Pakistan, Christian community has always demonstrated its sacrifices in every difficult time and all minorities are inline with us in safeguarding the motherland and they have spared making any sacrifice in this regard. He said that efforts of the Christian organizations for equipping the girls and boys with education are also laudable. Ch Parvez Elahi expressed the faith that all of us together as one nation will develop this land of ours as visualized by the Quaid-i-Azam.